http://cakecentral.com – Find forums to chat with others about cake decorating etc., photo galleries for inspiration, tutorials and more on this gold mine of a cake decorating (& more!) site. 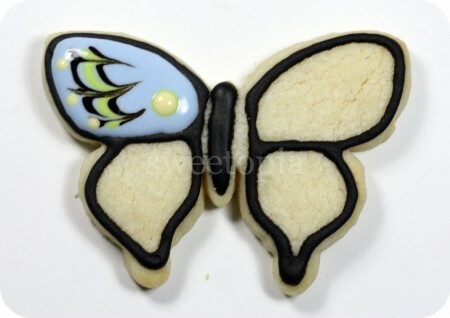 http://chiccookiekits.blogspot.com/ – Meaghan’s got a great site dedicated to all kinds of cookie decorating. In addition to publishing her own book, Cookie Sensations , she writes for www.craftgossip.com edible crafts section. http://www.youtube.com/watch?v=tZBXVveAEPE – Cat Cora from Iron Chef, shows how to decorate cookies on youtube.com. Hers is good for the beginner. There are lots of other video tutorials on youtube as well! There are so many other great sites out there; have fun surfing! Peggy Porschen’s books have great recipes, easy to follow instructions, and beautiful cakes, cupcakes and cookies. She has a new book coming out in July, Cake Chic . I can’t wait for it! Cookie Craft by Valerie Peterson and Janice Fryer is another excellent resource. It covers all the practicals of cookie decorating… from making or freezing the dough to a myriad of fab cookie ideas. Toba Garrett’s Creative Cookies is one of the first decorating books I’ve bought. 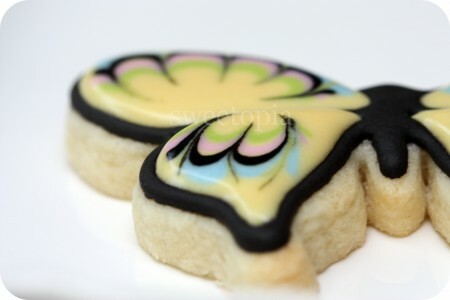 She covers many different techniques for decorating cookies, from piping royal icing, to covering them with fondant etc. For the beginner and advanced! Bonnie Gordon’s School of Cake Design (www.bonniegordoncakes.com) – Super if you live in the Toronto area! I enjoyed the cookie decorating class offered there and learned some helpful tips. There are many other great-looking decorating classes I’d like to try in the Toronto area, but haven’t taken the classes yet, so I can’t comment on them at this point in time. Decorating cookies is often called ‘flooding’ because you can essentially create a dam, wall or outline of icing on the edge of your cookie, and then ‘flood’ or ‘fill in’ that ‘dam’ with icing. There are those who like to decorate without using a dam by just applying the icing, but I find that I’m able to add more icing onto the cookie when the dam holds it in, therefore making the cookie surface look more thick and rich. One of the most important things I’ve learned about cookie decorating is that if your icing isn’t at the right consistency or thickness, the experience can be very frustrating. 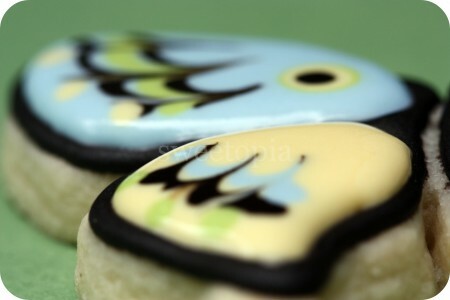 So, once you have made the icing, it ususally needs to be thinned a bit to create the best consistency for decorating. This means that it needs to be fluid enough so that it will flow just enough that it settles into your cookie dam, but not too much so that it runs over. You may realize that that the icing was thinner before you whipped it for 10 minutes according to the recipe, but it does make a difference in the texture that you mix it that long. Do mix it for 10 minutes and then thin it out if you need to. Add just drops of water at a time to make the icing runnier. 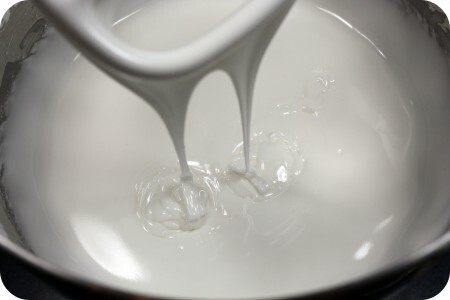 If you add too much water at a time it’s more difficult to thicken it with icing sugar than it is to add water to it. The trick I use to make sure my icing is at the right consistency, is called the “10 second rule“. 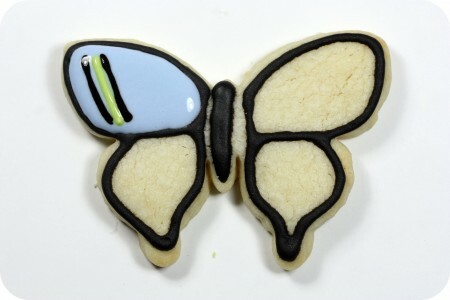 Drag a butter knife through the surface of your royal icing and count to 10. If the icing surface becomes smooth in anywhere between 5-10 seconds, then your icing is ready to use. If it takes longer than approximately 10 seconds, the icing is too thick. Slowly add more water. If your icing surface smoothes over in less than 5-10 seconds, it is too runny. 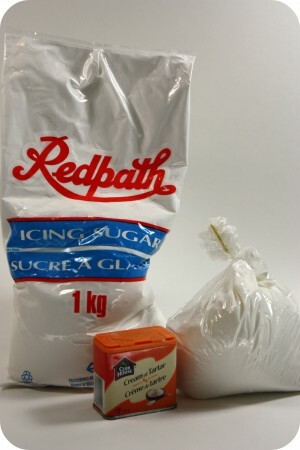 Mix your icing longer or slowly add more sifted icing sugar to thicken it. I learned a slightly different ’10 second rule’, through Sarah Bell at Bonnie Gordon School of Cake Decorating… she likes to dip a spoon into the icing, lift it and let ribbons of icing drop back into the bowl, and count how many seconds it takes to make that surface flat again. (5-10 seconds). Some people use a thicker consistency icing to outline their cookie shape and then a runnier one to fill it in. I have come to prefer using the same icing to outline and flood because it saves me time. (I don’t have to prepare two icings for each color, prepare two piping bags for each color etc.). That being said, the icing then can’t be too runny, because the outlines will not form properly. Some decorators like to flood their cookies with a very runny icing, so if you are one of them, prepare two icing consistencies, one thicker, one runnier. The thicker icing should not be so thick that it is dry and curls when you try to pipe it. It should just hold it’s shape when you pipe it onto the cookie. 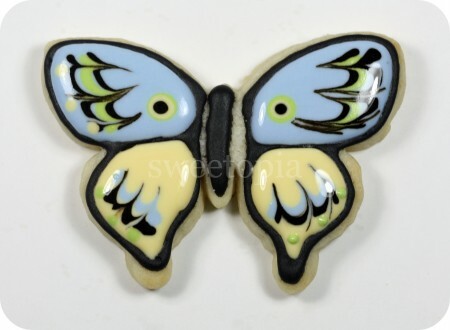 Once you’ve managed to reach the desired icing consistency, add food paste coloring of your choice. I use a toothpick to slowly add color bit by bit. 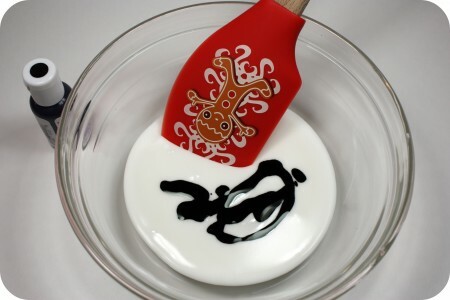 Because deep, dark colors such as red or black usually require a lot more food paste coloring, I’ll use the end of a butter knife to scoop out those colors if they’re in a tiny container. I should also add that I have come to prefer the Americolor brand for black especially. Americolor uses squeeze bottles which makes adding the color much easier, and it seems to bleed less into other colors. Another tip when it comes to adding color to your icing; the colors usually deepen with time, so I try to color my icings 24 hours in advance to see if I’m happy with them. Also, stirring your icing to add color will incorporate air into it, so if you leave the icing sitting for a while the air bubbles rise to the surface, where you can pop them by gently stirring just a little before you add the icing to the piping bags. One more tip to help avoid air bubbles in your piping bag; massage the royal icing a bit before you twist the top end of the piping bag closed. Press the icing in the bag upwards, starting from the tip and working your way up, pushing out the air bubbles as you go. Then push it back down towards the piping tip. I have disposable and non-disposable piping bags for decorating. Either are fine, however, I tend to lean towards disposable because I can quickly see what color each bag has in it. Important when timing is key! That being said, you could color-code each with a matching elastic if you don’t like using disposable bags. 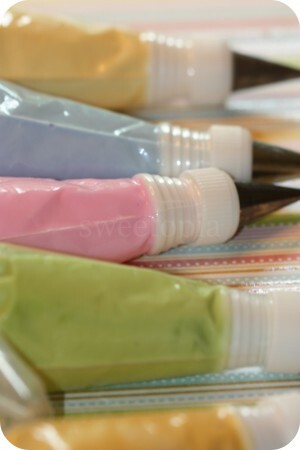 I’ve also tried using squeeze bottles with my students at school, and they’re also great for being able to see the colors easily, they aren’t very messy, and the icing can be kept in them as they’re airtight with the wee little lids. Trying not to lose them with teenage students is a problem though! Sorry guys it’s true! 😉 For me, the bottles are really only good for filling in, or flooding, so I tend not to bother with them for the most part. Cut off the ends of your disposable piping bags, insert the coupler, tip and close it off. I generally use a number 2 or 3 piping tip to outline my cookies and a number 2 – 5 to flood them. The larger the cookie, the larger the piping tip. 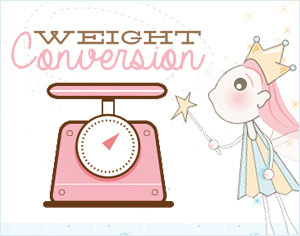 There are some great tips for small details, such as 00 or even 000, however they clog very easily! I like to use tip #1-#1.5 for smaller details. Get as many glasses as I have colors out, add a clean, damp cloth to the bottom of each, and set one empty piping bag into each as well, with the opening of the piping bag folded over the rim of the glass. Fill the piping bag with your royal icing. I find it easier to fill the bags with icing when I have two hands free. Twist the openings of the piping bags closed, and tightly secure them with elastic bands. Work over your icing bowl so that the icing dripping out of the tips doesn’t go all over your work surface. Rest your finished decorating bags back in the glasses until you’re ready to use them. Practice piping on your work surface so that your hand gets some practice before you begin the cookies. I usually find I need a few minutes to play around before my piping improves. 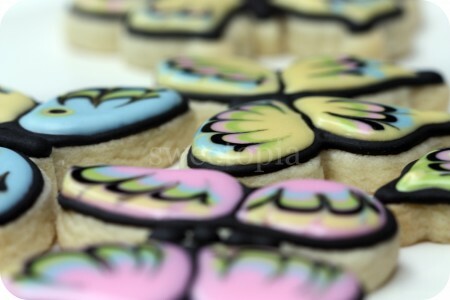 I decorate my least favourite cookies, or my extra cookies first; that way if I make a mistake it won’t matter as much! Outline the cookies first, and wait at least 15 minutes before you flood the inside of the ‘dam’. If the outline is a dark color such as brown or black, I wait 24 hours before flooding the cookie. It lessens the chance that the colors will seep into each other. If you live in a humid climate, air conditioning or a dehumidifier will help prevent color seepage as well. I should also mention, that if you don’t like the look of the outline on the cookie, outline your cookie and fill it in right away. The icing needs to be at medium consistency for this… not too runny or it will just flow everywhere, and not too thick or it won’t settle smoothly. To outline the cookies, hold the bag at a 45 degree angle and position the tip at a corner of the cookie. Put enough pressure on the bag so that the icing comes out and start moving towards the direction you’d like your icing to flow at the same time. 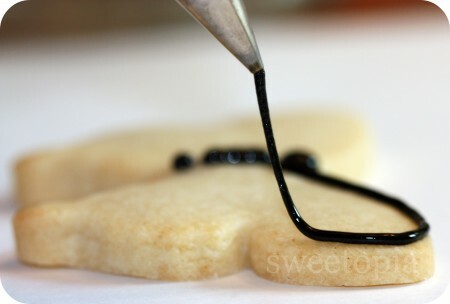 About a centimeter after you’ve begun your outline, start lifting the piping bag away from the cookie, so that the icing just falls onto the cookie. Start coming back closer to the cookie when approaching another corner. If the cookie is more intricate, or has more corners, you may not be able to just let the icing fall as there won’t really be room to. Also start to apply less pressure as you approach the corners. While decorating, every once in a while I twist and tighten the top part of the bag to create pressure so that the icing flows well. When your cookies are ready to flood use a #3 – #5 sized piping tip. The larger the cookie the larger the tip. Start at one area and quickly zig zag back and forth until you’ve covered your cookie. Don’t worry if you haven’t filled in every little spot; speed is more important at this point. If there are a few spots that haven’t quite filled in once you’ve basically covered the whole cookie, use your piping bag, a toothpick or a paintbrush (used only for food), to push the icing around and fill in the gaps. If you would like to add more icing colors to your cookie so that they ”meld’ into the base color, you need to add it right away. The base layer starts to dry quickly so you need to add your next colors as fast as possible. For example, I added these two black lines and one colorful line and then drag a toothpick through them. The ‘eye’ of the butterfly is then made by layering a few colored dots on top of each other, with the white or light color second last and black last. Dots are easy to make; position your piping bag straight above the area you’d like to pipe and gently apply enough pressure so that just a dot comes out of the tip. Stop the pressure on the bag and lift it away. Take your next color and keep layering, making sure that your dots get smaller each time. Fill in each wing or every two wings at a time. I hope this tutorial has helped you! I welcome any questions or feedback… Have I forgotten to mention something? Do you need clarification on anything? Please ask or let me know! If you like learning with video, you can also find me on YouTube, by clicking here. 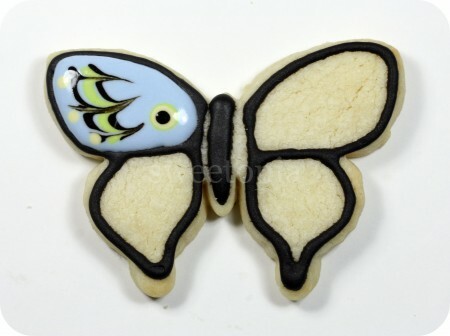 For some other butterfly cookie examples see this older post here. How important or necessary is is the cream of tartar and is there any substitud..what is mainly use for?? Hola Que Bello Lugar… Cuánto arte…Soy de Argentina y no se como puedo hacer el glasé.O cómo encontrar todo lo que le va a la mezcla.Quisiera que me detalle todo lo que necesitaria pero que encuentre en Argentina. Desde ya muchas Gracias. All your icing work is so incredible. I’ve been struggling just to pipe pretty rosettes onto a cake, so impressed at how talented you are! 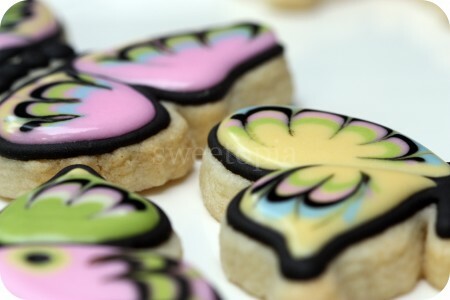 Can you tell me how those gorgeous plaque cookies are made? I’m horrible at the fancy writing! Does everyone know how to do?? Is it with a kopykake? Thanks soooo Much!!! Thanks for the tutorial, looks like Meaghan change her site’s url to thedecoratedcookie.com. Thanks for all the rest resources. I just made my first successful batch of iced sugar cookies for my daughter’s 3rd birthday. I can’t thank you enough for the wonderful tutorials and inspiration. Your entire site is invaluable! I can’t wait to make more cookies!!! I am making marbled spider web cookies. Can I eliminate the dam so I can pull the toothpick to the edge of the cookie? An further suggestions? hello 🙂 I have one question: how to make a really red colour of royal icing? I use wilton’s red and when royal icing is wet colour is just perfect, of course when it’s getting dry, colour looks … just terribly 🙁 can you give me some advice? I’ve just bought americolour (red tulip), maybe that one will give better results… do you have any idea how to make a really beautiful and intense red royal icing? I realize this is a late response but I have to share my experience. I worked in a food factory where we used a professional grade food coloring for icing, I can’t recall the name but it came in giant squeeze bottles. For colors like red or black we had to add excessive amounts of color, not just to tint the icing but to ensure it had greater longevity when it came to shelf life. This also meant that we had to use the most synthetic food coloring on the market because the company had issues with more “natural” color additives fading in the past. Try to remember that the more food coloring you add the worst your product tastes! Everybody on staff avoided eating black or red frosting like it was the plague. You just have to pick your battles I guess lol. I was wondering, do you colour your icing and store it in Tupperware for 24 hours before use? When you do go to use it, does it need to be mixed more, or does it stay the proper consistency? Ps. I just discovered your site on Monday and I’ve been on it every day since! I just watched your video on royal icing. I have a few questions. If you only want to use one icing for outlining and flooding, what is a good consistency? what second rule would I follow? Also, if I pipe and than flood with the same one, do I flood right away or do I wait a little bit? And if I am using the same icing to outline and flood, would I just change the tip for the flooding? Lastly, I see someone asked if we could flavor the royal icing and you said yes. Would we use almond extract? What would we use? I only decorate for my family but my royal icing dries to a dull finish. I was wondering how you get your icing to be shiny when it dries. I use icing sugar, meringue powder, water and almond extract. I would really appreciate a tip? Hi Ms. Marian… I need some help if you can be kind enough to help me… I just started baking and decorating sugar cookies… btw you are so talented.. Ok I’m gng to be making some cookies for my nephew’s wedding… I will be making round cookies with light pink as the base and a heart on top colored silver.. But I’m afraid that if I color the base first and let it dry… then add the heart and color the heart silver… im afraid the silver will bleed onto the base… bc I have not found silver food coloring… just that silver dust that is mixed with vodka.. What do you suggest for me to do first… do you know if I can buy silver food color… or if I used different colors to make the silver… any suggestions will be very helpful and appreciated.. Thanking you in advance for your help. Have a wonderful day! I also forgot to mention… I’m gng to start using the tipless icing bags… but don’t know how far from the tip I cut the opening on the bag… if you know can you please help! 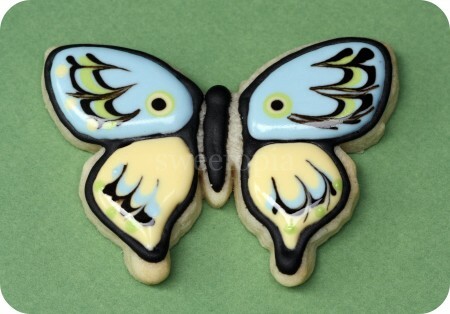 Wow, that Butterfly Cookies looks very well. Have some time in the next week and probably give it a try. Thanks for advices! Thanks so much for the information. I am getting ready to make my first ever cookies for my daughter’s baby shower. With your instructions, I am hoping for a successful product. Finding your info and videos very helpful. 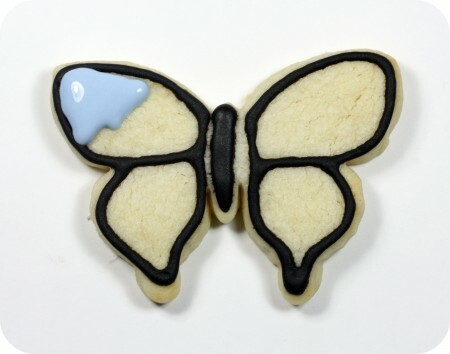 One question – can you use oil based flavours in royal icing?